Celebrate the city where they said "I do" with this personalized print. 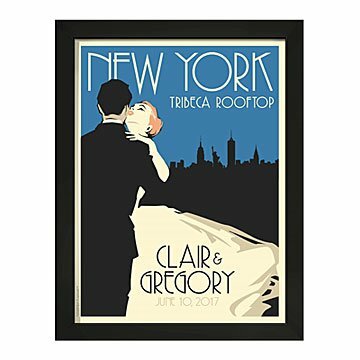 Help a happy couple celebrate the city where they said "I do" with this personalized skyline wedding print. Chicago-based artist Alexander Doll uses archival paper and ink to cast them as a classic couple against the iconic skyline of their wedding location. The print's nostalgic style takes its inspiration from nuptial announcements of yesteryear with its sharp typography and timeless lines. Alexander incorporates the couple's names, venue name, and wedding date into his design to give each print a warm, personal touch. Printed in Ohio. As i stated above it would be nice to see the end result of the photo and frame. We just see the proof. Also allow us to personalize the hair on the woman to be short or long. My gift was for a woman with long brown hair. I had no choice but to get her the woman with short brown hair. Have more personalizations on the photo. Shorter person vs taller. maybe eye color? definitely hair style for man and woman. Bought it as a wedding gift for a friend. Very special gift to give. So excited to give this to them. They will love it!! My fiance and I bought this for ourselves as a Christmas present and plan to display it at the reception of our wedding. We love it. It turned out great and we look forward to displaying it on the wall of our new home together. I had seen these years ago in a catalog and tore the page out, hoping that whenever I got married, they would still be available. I'm so glad the artist is still doing these and I got to get one of my own. I just love this poster! It came framed and easy to hand. The colors came out exactly as promised. We have had so many visitors comment on it and want to know where and how we were able to get it. A fabulous addition to our home!! I bought this item to use as a decoration at my upcoming wedding reception, and then to be able to hang in my home afterwards. It's such a neat item and I'm really happy with it. The customization is easy to do and looks great. If you want a unique item to remember a special event this is perfect!